In my previous post I covered the technical part of the Caol Isla tour. For the cask Experience, it was only my wife, myself and our witty and vivacious guide, Hazel. Oh, and four casks, from sprightly and newish to seriously grungy and old. The star of the show was the whisky of course but I have to preface this entry to say our host made the day. Hazel is a genuine Islay girl (her dad works at Bunnahabhain, so her Scotch chops are genuine) and unlike the charming Kirstin at Glenfarclas, Hazel actually likes Scotch. We shared the drams with her and had a rollicking time. We sat in a large, bright room (the sun does come out on Islay) lined on one side with stools along a workbench, while on another wall were a series of bins for barrel staves with a sign admonishing to ‘wear gloves’ just above. The casks were in the center, beyond which two picnic tables had been covered with black cloth. A cherry sideboard and various posters gave that side of the room a warmer feel. Overall, unpretentious and casual—a nice break from some of the more marketing-heavy locales. We settled in with Hazel and a set of glasses while she chatted about each cask, valinched out a quantity and poured. We had water handy as these were some powerful spirits..
L-R: 1988 ‘forgotten’ Sherry, 1996 Sherry, 2006 Bourbon, 2012 Bourbon. Click for hi res. First up was the unpeated selection, sensible as we would, by the time we were through, assail our palates with some heavyweight peat. This was not from a single cask, but a marry of first and second-fill bourbon casks, but undiluted: 55.9% ABV. I remember a nice vanilla, peppery nose with honey and grapefruit peel rounding out a balanced and summery profile. This is similar to the Caol Isla 18-year release which I will be reviewing soon. Next up was a refill Bourbon cask from 2012, so about 5 years old at that point. A sturdy 60.9% ABV and I braved it straight at first just to get the full whack. This cask had a noticeably smoky nose, more so that your commercial release (which would blend multiple casks) with a moderate vanilla component. My notes say ‘an aggressive palate’ heavy with phenols and oak tannin. Fascinating, but not a daily dram! Next was a first-fill Bourbon cask at 61.9% from 2006. Interesting that although older, this cask had a higher ABV than the 2012. Hazel explained the reason for these two casks being selected was to illustrate the effects of age: more vanilla, more toffee, and theoretically less alcohol due to the angel’s share. Well, the alcohol did not prove out but the flavor did. This was a much more approachable spirit. The nose had a lighter peat with more vanilla and some orange. A sip brought out seaweed, salt and iodine. The finish was oaky, the phenolic aromas lingered long and overall it had an oily mouthfeel. I enjoyed this quite a bit and would definitely buy for special occasions. Hazel explained that at times, distillers will send casks to other distilleries to age as the warehouses rotate their stock. 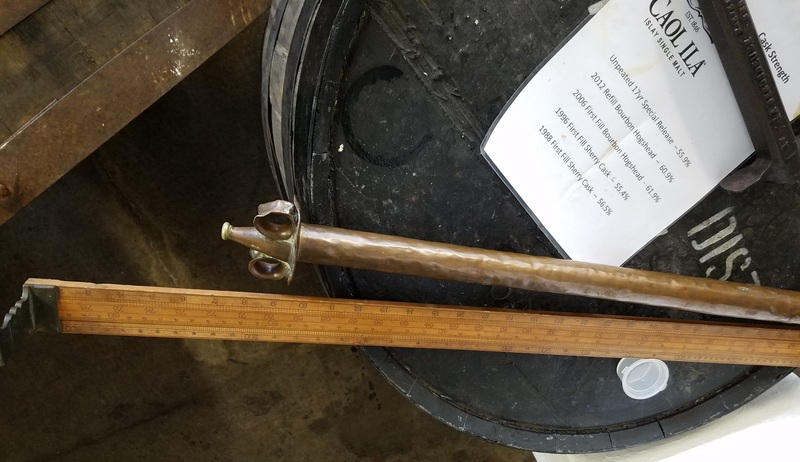 In this case, the cask had been forgotten for some years, and a malt master at the other locale stumbled across it and asked if they wanted it back. At 29 years in cask, this is some serious whisky. The problem is, that long in cask, with no one sampling, means it may have passed its best flavor profile. No doubt, this was one gnarly dram. Still a hefty 56.5% alcohol, this spirit had less smoke and more oil than the 21-year cask. A lot of oil. It had a creamy, thick mouthfeel but also so much phenol that my notes state “rubbery”—a thick oily, rubbery dram. I can see why the malt master decided this could not be bottled, not in any blend. Still, the experience was fascinating and I really enjoyed sipping this. The 1998 would be my pick if, stuck in the South American jungle, I needed something to drive parasites from the body. Being part of a monster multinational, and a huge producer in their own right, I expected Caol Isla to present like Glenmorangie: corporate, slick, controlled. But what we found were folks working in an unpretentious fashion to produce a damn good whisky. I really liked the homey atmosphere and we came home content with a special bottle, a t-shirt (which is very comfortable BTW) and happy memories of a day well spent. 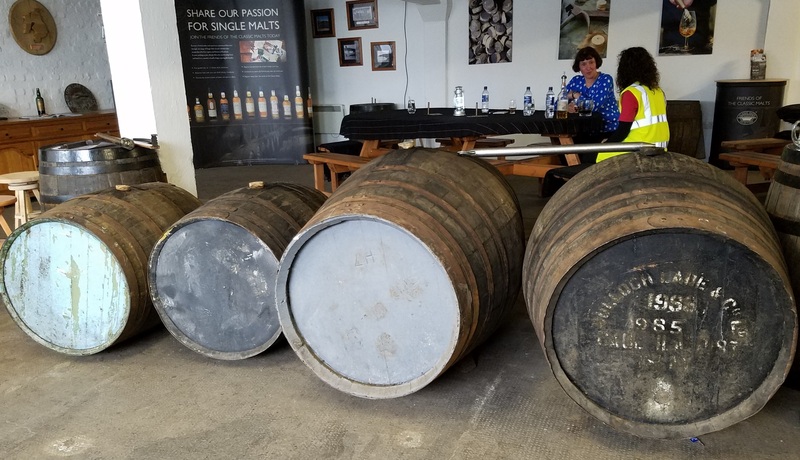 This entry was posted in Distillery Tour, Scotland, Whisky and tagged Caol Isla, Cask tasting, Islay, Scotch. Bookmark the permalink.